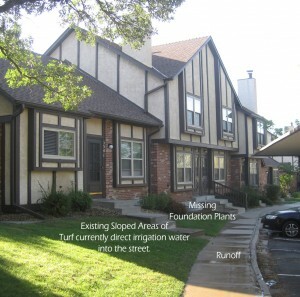 This photograph illustrates some of the concern of inappropriately placed turfgrass, the runoff concerns and an overall concern with water conservation. We recently completed a Landscape Master Plan in Colorado Springs on the northwest side of town. 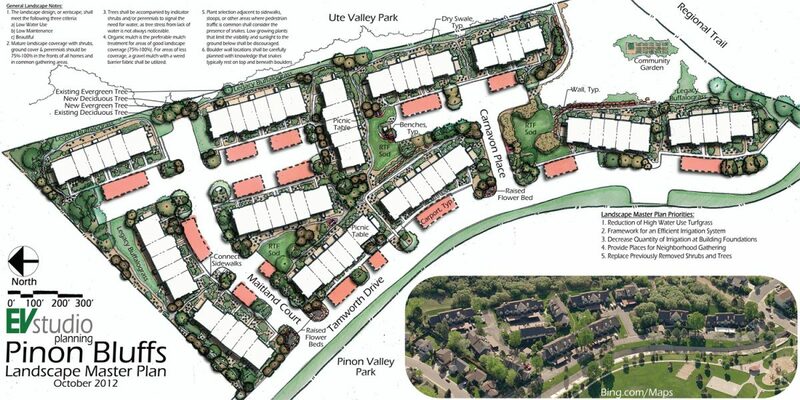 The Master Plan was in response to increased water costs, maintenance concerns and as a retrofit to trees and vegetation that were inappropriately planted in the 1980’s. The neighborhood was near the Waldo Canyon Fire that destroyed 346 homes in Northwest Colorado Springs in June, 2012. This was a concern and consideration that was taken into account with recommendations for more xeric plant material near the homes, and the removal of trees near the foundations of the homes. Philosophical discussions were a part of the process regarding the fire, because a “fire-proof landscape” is really an oxymoron. All plant material has the ability to burn, however there are plants that will perform better in these conditions. They are generally plants with a lower density of twigs and branching and xeric plant material, or plant material that has the ability to store water within the plant. Other concerns and mitigation priorities included decreasing turfgrass, especially adjacent to the buildings, and replacing vegetation throughout the property. Narrow Areas of Turfgrass: The EVstudio General Rule of Thumb for turfgrass is to not have turfgrass in areas less than 7-ft in width for maintenance and irrigation concerns. Large Trees Adjacent to Foundations: This is a concern for the growth of the tree; damage to the buildings; and in the instance of fire-prone climates, the tree serves as a wick for the home. Over-sized Shrubs Near Homes and Circulation Areas: This creates a concern for public safety and can be a place for criminals to hide near access points to homes. 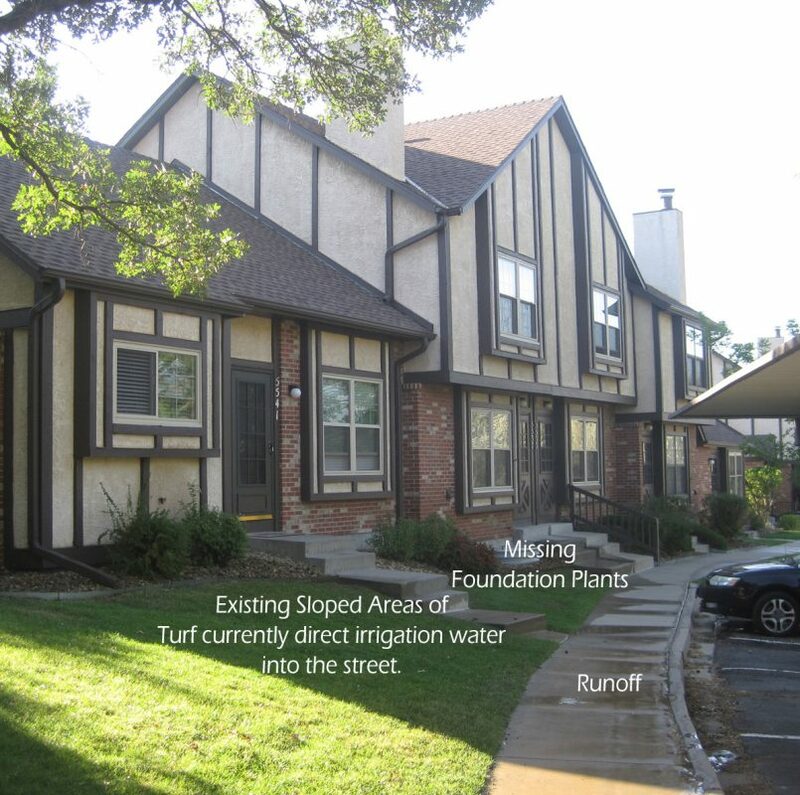 Over-Irrigation: A common mistake is the irrigation of sidewalks and other impervious surfaces. This creates a waste of water and an increase to urban drainage issues. Some municipalities and utility company actually fine businesses and homeowners for this over-consumption and wasting of water. This is present on the property. Conversely, the property also has an over-stretched and outdated irrigation system leaving many areas of turfgrass and trees to be without irrigation. The Landscape Master Plan suggests a reduction of high water turfgrass and where Medium Water Turfgrass is to be used, it can be only in locations for gathering and celebration. Landscape Edging: Which Variety Should I Use?